Gulanga Artwork | ACT Council of Social Service Inc. 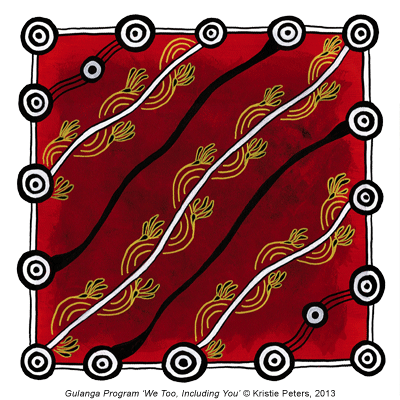 The Gulanga Program logo is based on an artwork by local Aboriginal artist Kristie Peters. The Goanna Tracks – represents Gulanga and the impact it has to encourage change which then leaves imprints of influence towards reconciliation between Aboriginal Peoples and all Cultures. The Meeting Places – represents different places where we gather and meet while we are moving in the same circles. The Travelling Lines – the unbroken connections between the meeting places and the goanna tracks represents – The continuation of many networks between all services who are supporting disadvantaged groups within the ACT. About the Artist: Kristie Peters is a Wiradjuri woman from NSW and a promising young artist with a natural talent and a curious mind eager to explore many different mediums. Her talent is eye-catching and well executed. Her style of art is a mix of contemporary traditional using acrylic paints on canvas. Kristie’s story is a growing one where she is literally hoping to carve out a future for herself and her family by using her natural gift.